Tears and cheers erupted across the Americas on Wednesday as an Argentine cardinal became the first pope from the hemisphere, and many expressed hope that he help bring the church closer to the poverty-wracked region that is home to more Catholics than any other. Lucila Mejias, a student at the Catholic University of Argentina in Buenos Aires, said she expected Francis' papacy to help renew the church worldwide and in her home country in particular. 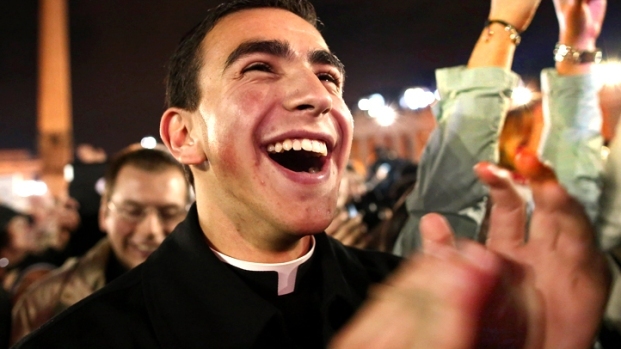 "Bergoglio has great charisma with young people. He is very profound and realistic at the same time," she said. "I hopefully wait for him to lead the Church with the enthusiasm that he has transmitted so many times in his lectures." Cars honked their horns on the streets of Argentina's capital, and television announcers screamed with elation at the news that the cardinal they knew as Jorge Mario Bergoglio had become Pope Francis. Cardinal Jorge Mario Bergoglio of Buenos Aires was named leader of the world's 1.2 billion Catholics on Wednesday after being elected pope. He will be known as Pope Francis. "It's incredible!" said Martha Ruiz, 60, as she wept. And a Florida man who grew up in Argentina and knew Pope Francis there praised the priest who, decades earlier, had given Mass at his Catholic school, NBC 6 South Florida reported. "He was just like any other person, and you could truly instill your trust in him," Guillermo Russian told NBC 6. A California priest, Fr. Arthur Leibscher of Santa Clara University, who also knew Francis personally described him as a man of "tremendous simplicity" who "stands by his conviction and his teaching. "He's not pandering to anything except the need to be faithful to God," Fr. Leibscher told NBC Bay Area. The excitement reverberated throughout the United States, particularly in Latino communities. Yadira Mejia, a senior at a Catholic high school outside Philadelphia whose parents are Ecuadorean, told NBC 10 Philadelphia that she was overjoyed by the news of the new pope, and his Latin American origins. "It's like injecting life back into the church," she told NBC 10. "I feel like there's a lot of emotion in the Spanish communities. Maybe some of those ways of celebrating Masses, with a lot more festivities — maybe that will be implemented into the church." The news had taken Carlos Encinas, an Argentine living in New York City, by surprise — but welcome surprise. Gerardo Sportella, another Argentine in New York, said Bergoglio is "a very good man." 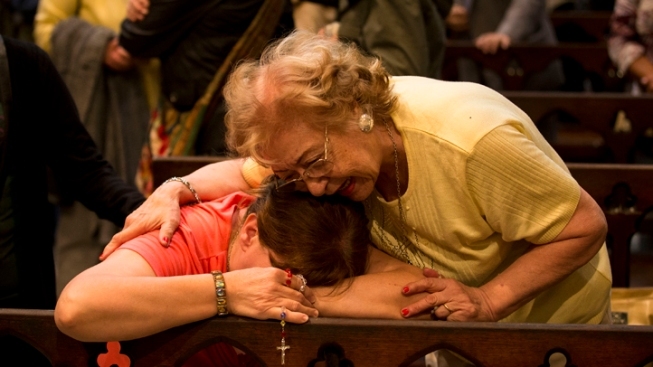 "For Latino Catholics, we see it as a triumph. The first reaction is triumph, but ... with the triumph comes the cross," Gustavo Calderon, a parishioner at St. Mary's Cathedral in San Francisco, told NBC Bay Area. And in Los Angeles, Archbishop Jose Gomez said at a Mass on Wednesday that the selection of Francis as pope "shows the importance of all of us in this continent as part of the church," NBC 4 Los Angeles reported. Juan Martinez, a faculty member at Fuller Theological Seminary in Pasadena, Calif., agreed — and said Francis' Jesuit background would set him apart as a pope, too. "The reality of living amongst the poor and those who suffered in the majority world gives him a very different perspective from the previous pope," Martinez told NBC 4 Los Angeles. "It is an experience that is more common among the majority of Catholics." "It's a huge gift for all of Latin America. We waited 20 centuries. It was worth the wait," said Jose Antonio Cruz, a Franciscan friar at the church of St. Francis of Assisi in the colonial Old San Juan district in Puerto Rico. Bergoglio's former spokesman, Guillermo Marco, told Argentina's TN television station that the new 76-year-old pope — who is also the first from the Jesuit order — "has enormous pastoral experience" with a humble bearing. That common touch was evident in the new pope's first words to the crowd. "I couldn't believe what I was seeing, when he started saying, 'Good afternoon,' just like someone saying hello to a friend," said Bishop Eugenio Lira, secretary-general of the Mexican Conference of Bishops. 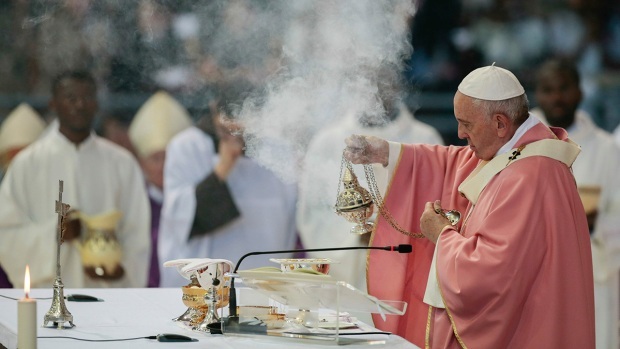 "He will certainly be the pope who is closest to the people of Latin America. He knows the problems of Latin America very well." Nearly half of the world's Roman Catholics live in the Americas, north and south, or the Caribbean. In Cuba, parish priest Gregorio Alvarez said he believes Pope Francis' background could lead the church to focus more on the ills afflicting humanity, and less on internal issues. "Being Latin American gives him an advantage. He understands the problems of poverty, of violence, of manipulation of the masses," Alvarez said. "All that gives him experience for the job. ... He's one of the family." Even Argentine President Cristina Fernandez, a sometimes antagonist who once compared Bergoglio's stands on abortion and gay rights to "medieval times and the Inquisition," offered congratulations. "It's our desire that you have ... a fruitful pastoral work, developing such great responsibilities in terms of justice, equality, fraternity and peace for humankind," she wrote in an open letter. Latin America has some of the world's sharpest divides between rich and poor and Marvin Cruz, a Catholic at the Parish of the Miraculous in the Honduran capital of Tegucigalpa, said the pope's "main challenge will be the fight against economic inequality." "He's going to pay particular attention to the people and the people are the church," Cummings said. The bishop at the head of Venezuela's church, the Rev. Diego Padron, remarked, "All of Latin America is dropping to its knees to pray, to thank God for this extraordinary gift that he has given us." "I am convinced this pope will make extraordinary changes, beginning with his gestures today," Padron said, referring to Francis' bowing to the crowd at St. Peter's Square, "asking for a prayer, showing great humility and at the same time displaying a great change." Bruno Scherer, the brother of Brazilian Cardinal Odilo Scherer, sat by himself in a square behind the main Catholic church in the Scherer family's hometown of Toledo in southern Brazil. "I think that because of his age — he's still quite young — he wouldn't want to lose his liberty. He wants to keep traveling, taking photos, and doing his thing. ... Well, let's at least think that."